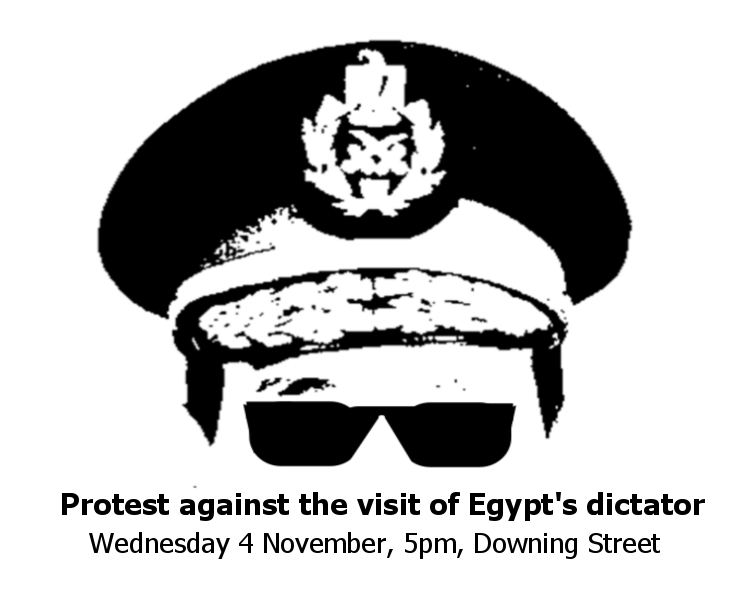 Egypt Solidarity Initiative will be joining with other organisations in a joint protest at 5pm on Wednesday 4 November at Downing Street against Sisi’s visit. Please help us spread the word. We need mobilise as many people as we can to send a clear message that Sisi is not welcome in the UK. Click here for more background on the visit and downloadable leaflets / posters. 1. Sisi destroyed the aspirations of millions of Egyptians who took part in the January 25th revolution, setting the historic clock backwards and abruptly ending the nascent democratic experiment that replaced 30 years of Mubarak dictatorship. Regretfully, the dictatorship is back to business in Egypt, with Egyptian rulers brazenly trampling on the rights of citizens while Western governments support it . 1. Tell Cameron that Sisi is not welcome in the UK: Join the demonstration called by Stop The War, the Egyptian Revolutionary Council, Stop Sisi Campaign, Muslim Association of Britain, Egypt Solidarity Initiative, 6th of April Movement, FOSIS, Campaign Against Arms Trade, Union Solidarity International and Platform. The protest, on November the 4th, 2015, is against Sisi’s visit and will be in front of 10 Downing Street from 17:00 to 19:00. 2. Write to your MP, using this tool or independently. Ask them to reject Sisi’s visit by signing the Early day Motion 279 which has already been signed by 49 MPs. 3. Sign the petition on the UK Government website: Cancel Sisi’s invitation to the UK. 4. Follow the websites and sign-up to the newsletters of the organisations below to get more information and see how you can help the cause.